Of this list below, my favorite one is Trifecta so far. Delicious meals, fast delivery, and reasonable pricing for the quality of food you get. If you have to eat dairy free, then you already know that it can be a real pain to search on Pinterest to find meal ideas that don't contain some kind of cream, cheese, or other dairy product. Avoiding dairy certainly isn't easy in the American world of cheesy-everything! Luckily, unlike gluten-free meals, there does not need to be any special preparation process for dairy free meals. For example, people with extreme forms of celiac disease cannot even eat food prepared with machines that touch gluten. With dairy free meals, as long as there's no dairy in it, you should be safe. That means you'll have more options to choose from when it comes to prepared meals delivered to your home. This is also a great service to leverage if you have just one lactose intolerant person in the home. That means you can prepare whatever you want and if that person can't (or doesn't want to) eat it, they have a stash of meals in the freezer. This is what I do with my girlfriend when I want to make a cheesy risotto for dinner. She can just have one of her frozen dinners on those nights, and we eat dairy free the rest of the time. Here are all the dairy free meal delivery services I've come up with so far based on my research. These meals are already prepared and do not require cooking (just heating). I've also got a list of meal kit services with the same theme. Those are like Blue Apron, where they deliver the ingredients and you do the cooking. Also a good option for busy homes! Do you know of more services? Let me know in the comment section and I'll add them to the list! 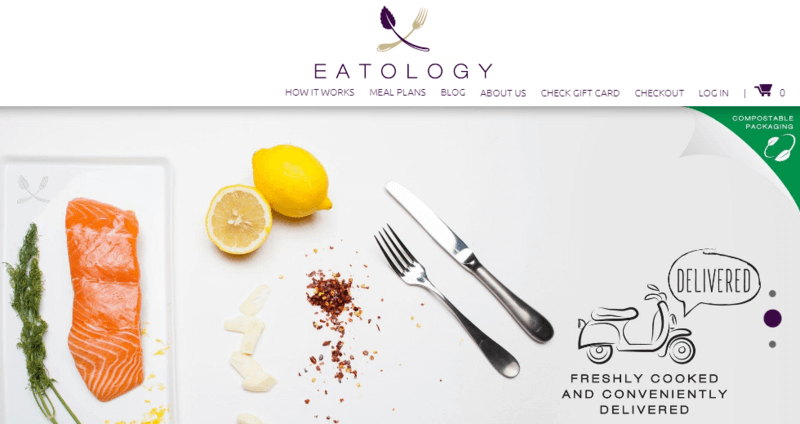 Eatology focuses on clean eating and natural meals, providing you with meals that are more similar to restaurants, rather than the freezer section of your local grocery store. All of their meals are gluten-free, while they also avoid hormones and preservatives and aim to keep the sugar and sodium content low. The company doesn't have specific diet-based menus but they offer the chance to modify packages based on your dietary preferences. This means that you can have dairy free meals regularly, with ease. The most unusual thing about Eatology is their meals. In particular, Eatology categorizes its portions as either two blocks (2B), three blocks (3B). The 3B option is roughly 30% larger than the 2B. This works well for anyone who feels that other meals don't contain enough food. Nutritionally, 2B meals contain an average of 14g protein, 18g carbs, 3g fat and 155 calories. The 3b ones have an average of 21g protein, 27g carbs, 4.5g fat and 232 calories. So, the differences are substantial. They recommend the two block option for women and the three block for men. There is also a Big Menu with family platters. Eatology offers two sizes of meals and a family plan, making it a great choice for people who want more to eat per serving. There are two ways to order as well. The first is one-time orders, which allow you to order 10, 15 or 21 meals. You can choose these individually or have them chosen for you. Alternatively, you can sign up for an auto-ship plan, which delivers meals to you weekly. This can be canceled at any time and gives you 20% of the price for weekly and monthly orders. Without discount, the ten meal package costs $105, the 15 meal package $157.5 and the 21 meal plan $220. Shipping charges start at $25. Dave founded Paleo on the Go in 2012 after suffering from nutritionally-related health problems. The meal service was his attempt to help everyone else deal with similar food-based issues. The food service delivers already cooked meals nationwide. Their meals follow are all paleo and are free from grains, gluten, dairy, soy and pastured meats. The one exception is that some meals may contain ghee. This is a type of clarified butter that sometimes used on the paleo diet. It is also suitable for many people who avoid dairy, as it contains little to no lactose. If you need to avoid dairy entirely, you can shop through the companies autoimmune protocol menu (AIP), which excludes ghee and nuts as well. Paleo on the Go also has a Strict 30 plan that is suitable for anyone wanting to reset their diet. This is similar to the Whole30 principle and removes both artificial and natural sweeteners, along with paleo-ized desserts and junk food. This is designed to help you improve your relationship with food and help you identify any types of ingredient that you may have an issue with. The prepared meals service also offers free-range meats, wild-caught seafood, and organic fruits and vegetables. Their meals are also non-GMO and pesticide free without any preservatives or processed oils. Their Butternut Squash Bisque and Pasta and Gyro Meatballs with Tzatziki Sause are some of their dairy-free dishes. Paleo on the Go is a paleo-based company and also offers AIP compliant meals. Some reviews suggest that the meals don't have enough seasoning but not everyone agrees. This is a common issue with delivered food services in general, as people vary so much in their seasoning preferences. The best way around this is often just to add seasoning yourself. The pricing for the 30-day meal plan is $395.47, and with their other menus, order prices depend on the individual meals chosen. The starting price for dinners is around $10 per plate. You can also provide meal bundles as well, which contain multiple meals and are sometimes discounted. Chef Pete and his wife Sarah adopted the Paleo lifestyle and founded Pete’s Paleo, a meal service that follows paleo principles. This includes ensuring the meals are free from gluten, soy, and dairy. Likewise, the product used is organically grown and non-GMO, while the meat is grass-fed and pastured. The company has a strong focus on flavor, making sure their meals taste amazing first and foremost. They also heavily rely on seasonal ingredients, incorporating local farmer harvest into the meals. This creates much more variation than most other companies, along with some very interesting meals. This style does mean that you have less control. You can't choose which individual meals you want each week. Instead, you receive what the decides. The meals are amazing but this style may mean that you occasionally get ones you don't like, especially if prefer some ingredients over others. Pete’s Paleo food is never frozen and arrives at your doorstep fresh in vacuum seal packs. Although the food is ready-made and all you do is heat it, you still get a sense of fine dining. In fact, the meals are more interesting and appealing than many alternatives. They store the food in vacuum sealed packs, ensuring that the meals remain fresh. Pete's Paleo has a menu that varies seasonally and has a strong focus on flavor. The food service has five meal plan options including the five, ten and 14 meal plans, along with vegetarian and the family options. They also have the ‘Eat What You Love’ choice for when you just want to try the food service before committing to a subscription. The price for the five meal plan is $123 and $189 for the ten meals option. The 14-meal plan costs $249, the vegetarian program which consists of 30 meals goes for $129, and their family plan costs $324. 22 Days Nutrition came to birth after a collaboration between Beyonce and her trainer Marco Borges. It is a prepared meals service that delivers vegan meals and plant-based nutritional powders. Their meals are low in sodium and sugar, while also being free from soy and dairy. The food service works for anyone on the paleo, vegan and vegetarian diet. The 22 Days Nutrition meal packages include one, two and three meals per day. You can either order the five, seven or the 22-day plan. They do have an A La Carte menu that is perfect for sampling their meals. The food arrives fresh, and all you need to do is heat it up in your microwave or oven, and you have a ready meal. 22 Days offers 5-day, 7-day and 22-day plans that deliver high-quality foods. But, you don't get to choose the menu yourself. They cater to the calorie-conscious individual by ensuring their breakfasts range between 250 and 400 calories. Their lunches and dinners contain between 400 and 600 calories. The 22 Day Nutrition chefs come up with creative meal choices with a considerable variety. The only issue with the meal delivery service is that they do not have meal customization options. So, you don't get to choose what meals you receive. The 22-day plan goes for $9.50 per meal with a $20 shipping charge. You pay shipping costs for the first two weeks and get free shipping on the third week. The seven-day plan costs $11.50 per meal, and the five-day program costs $12.50 per meal. For an A La Carte meal, breakfast costs $6.95 while a lunch/dinner meal costs $12.95. However, the minimum amount you can purchase with an A La Carte order is $75. Trifecta is a San Francisco-based prepared food delivery service. They offer high-quality meals that are 100% USDA certified organic, gluten-free, dairy-free, and soy-free. Their meals are also never frozen and are wild caught/grass-fed. The company focuses on exercise and training, so the meals they offer tend to be nutrient-dense and powerful as well. There are also five themed menus that you can choose from, which are paleo, clean eating, classic meals, vegetarian and vegan. Because all the meals are dairy free, you can choose which plan suits you the most. Most meals also include traditional veggies and fruits, along with ingredients like Portobello mushrooms, squash, and eggplants. The meals tend to be more conventional than some of the other items on this list but they still taste great and there is plenty of variety. Trifecta has a strong focus on powerful meals and also allows you to get a meal up to every day of the week, a service that many other companies don't provide. Trifecta’s meal plans start at $108.48 per week for the paleo and clean meal plan options. The vegan and vegetarian plans cost $113.90 per week, while the classic plan costs $119 per week. Those prices are for two meals per day, for five days each week. You can increase this to up to four meals per day and seven days per week, although the cost increases as well. On average, you're spending about $10 to $14 per plate, which varies depending on specific meal type and amount ordered. The nutrition label accompanying the order provides a list of ingredients and the dietary information for every meal. Trifecta also has a live chat support option on their site, which makes it even easier to reach them for help. They offer free deliveries to customers' doors across 50 states. The food comes in vacuum sealed packaging and lasts up to two weeks in the fridge and over six months in the freezer. You could use the notes section on the Shipping Info page to specify any other food allergies that you have. Kitava has a strong reputation for high-quality food and is considered one of the leading food delivery services. The company is unusual in that the meals are free from corn, peanuts, refined sugar and seed oils, while also avoiding gluten, soy, and dairy. As a result, Kitava prepares their dishes using non-inflammatory organic oil such as avocado, olive and palm oil. They incorporate raw honey, coconut palm, and maple syrup as a sugar substitute to ensure low glycemic content in their desserts. This makes it a perfect choice for people with autoimmune conditions and food allergies, along with anyone focusing on clean and natural meals. The meals from Kitava fit into many healthy parameters and the company uses networks like UberEATS to provide fast delivery. There are also customization options, such as the source of protein. For example, the Baja Bowl can use pastured chicken, wild-caught salmon or cumin-spiced beans for protein. Examples of the meals include dishes such as Zoodles and Meatballs, Meatloaf and Sweet Potato Mash, and Spaghetti Squash Bolognese being included in their menu. The one limitation is that there aren't many meals available at any given time, so your flexibility is limited. The lunch and dinner menu meals range between $10 and $18, appetizers between $5 and $10, side dishes for $3 to $8, and desserts for about $3 to $5.95. Their delivery fee ranges between $3 and $5 to most parts of San Francisco. They also provide detailed nutrition info and photos of every dish during meal deliveries. They also use massive networks such as Uber Rush, Door Dash, and Grub Hub for efficient ordering and delivery services. However, the service is primarily located in San Francisco, so it doesn't deliver as widely as other parts of the country. Magic Kitchen delivers fresh, ready-to-eat meals to your door. They offer a variety of hand-made meals shipped to you in a frozen state. Their dairy-free meal plan comes with a variety of options suitable for vegans, vegetarians, and lactose intolerant people. The meals are less exciting than with many other companies and may not taste as amazing. The key advantage is that many different diet types are covered, including senior-specific plans and diabetic, renal and dialysis-friendly meals. There is also a low-carb meal plan with less than 9g (0.3oz) of carb per 100g (3.5oz) of food and overall less than 25g (0.88oz) net carbs in a complete meal. Their dairy-free meals have 3 grams or less of fat per 100g, and between 20mg to 2g (0.07oz) saturated fat per serving. Magic Kitchen caters to more complex dietary requirements than most other companies, although their meals are less exciting. Their A La Carte dishes offer a variety of both sides and complete meals with complex flavors and textures. Some examples of their dairy-free dishes include Baby Clams with Linguini Marinara and Barley Vegetable Pilaf. Their pricing ranges from $11 to $12 per meal with great seasonal offers and discounts. Depending on your location, their delivery costs start at $18 and $20. Although their food pricing is fair, it is expensive after factoring in shipping costs. Their pricing makes them a less affordable option for low-wage families. Magic Kitchen also does not accept orders below their two-serving minimum, and they also lack variety in their dairy-free dessert options. Fresh n' Lean offers a wide variety of globally-inspired cuisines including Mediterranean, Continental, South American, and Asian dishes. As the name suggests, there is also a focus on fresh foods, which includes the use of natural and organic ingredients. The meals themselves tend to be low in fat and sodium. Their regular customers include people leading a healthy and fit lifestyle or those on a mission to shed off some weight. Seniors on low-carb, organic or vegetarian diets can also use this food delivery service. Their weekly-changing menu provides different delicacies to try out every week. There is no specific dairy free plan from Fresh n' Lean but some of their meal plans are dairy free. For example, the Gluten Free Meal Delivery Program is plant-based and doesn't contain gluten or dairy. There is also a range of dishes on offer. However, be aware that the pastry dishes will taste a little bit unusual, as is typical for baking while avoiding gluten and dairy. Even so, you will love the taste of their uniquely textured meals. There is also a vegan meal plan, which is dairy free by definition. Fresh n' Lean focuses on healthy food for weight loss. There are many plans to choose from, including some that offer dairy free meals. One limitation of the service is the minimal inclusion of raw ingredients, along with the lack of fresh salad options. The meals are also designed to support weight loss. So, they may not be as filling for anyone not trying to lose weight. Even so, their meal plans are affordable, with their standard daily package coming in at $27.99 for three meals. They do have a one-meal option at $14.99, while their lunch and dinner plan costs $23.50 daily. You can also order A La Carte and the pricing depends on the meals that you choose. Like most delivery service, they provide free delivery services. There are some cheaper services out there, of course, along with many more expensive ones. Ultimately, whether Fresh n' Lean works for you will depend on your needs and priorities. Hungry Root isn't quite a prepared meals company but it's not a meal kit service either. The company offers a range of prepared ingredients and meals. Some of these can be simply heated and eaten, while others require you to combine multiple sets of ingredients and cook (normally for around 10 minutes or less). The style is unusual but it can work well in many situations. The cooking is also much less than meal kit services, which is why I've included the company in this list. Veggies form the heart of a majority of their meals with low-calorie, and nutrient-dense treats included. Also, their menus include a variety of noodle and Thai foods dishes. The meals service uses ingredients that are organic, dairy free, and gluten-free. There is also a focus on keeping sugar content low and relying on natural ingredients such as celery roots, sweet potatoes, avocados, rice, cashews, almonds, and carrots. Hungry Root offers pre-packaged individual ingredients that need to be combined, often with a little cooking. They offer two meal plans: The Starter Set and The Good Life. The Starter Set includes three meals (2 servings each) with four sides, snacks, or sweets (which are large enough to share). The Good Life consists of five meals (2 servings each) with five side dishes, snacks or desserts. The Starter Set goes for $59 per box while the Good Life plan goes for $79 per box. The bundle comes with no shipping fees. You get $20 off plus free shipping on your first order. Like most paleo companies (but not all), Paleo Power Meals provides a range of dairy-free meals that you can choose from. These are delivered fresh and focus on healthy and sustainable protein. The company even links through to its suppliers, showing exactly where their seafood, beef and poultry comes from. Surprisingly, there is little to no mention about produce. It’s not even clear whether the company is using organic ingredients, despite their claims about transparency. The focus on power isn’t just in the name either. The meals are also high in protein, more so than many other brands. This can make them much more satisfying. Paleo Power Meals has a variety of meals to choose from, along with bulk menu items. You can place recurring orders with the company but there are no set meal plans. Instead, you choose the dishes you want from their menu, which stays mostly the same from one week to the next. The meals include breakfast, lunch and dinner. There are also some snacks available and the ability to buy some individual components in bulk. For example, one bulk menu item is simply one pound of grilled chicken. Another is one pound of sweet potato French fries. Prices range depending on the dish but the dinners and the bulk menu items are typically between $12.95 and $14.95. Breakfast, lunches and snacks cost less. You can save up to 15% by ordering in bulk and you pay for shipping, unless you order more than $75 of food. The service is effective but there are some limitations too. One is the nutritional details. Most meals offer basic information, like the protein, carb, and calorie counts. But, there are no details about other areas of interest, such as the amount of sodium per serving. The ingredients lists are also relatively basic. This can make it difficult to identify any potential allergens. This company makes it into many meal services lists, simply because it is so flexible. Unlike most other options, Top Chef Meals actually prepares the dish when you order it, rather than having already prepared meals ready to go. This style allows them to accommodate many more dietary preferences and contributes to their wide selection of meals. Those dietary preferences include the following options: low sodium, diabetic, gluten-free, dairy-free, low fat, weight loss, paleo, and renal diet. Selecting any one of these on the site will take you to the appropriate subsection of their menu, where you can order the meals individually. You can visit the entire menu and filter by dairy-free if you prefer. Top Chef Meals is a flexible company and meals tend to be inexpensive. An unusual aspect of Top Chef Meals is their entrée and sides system. Here, you order an entrée (like BBQ Pulled Turkey) and choose two sides to go along with it. The sides are often a starch and a vegetable, although you can sub for two vegetables if you prefer. Nutritional information is provided for each component and they’re tagged with information like low sodium, dairy-free and the like. As a whole, the system gives you much more control over your meals. That’s perfect if you have multiple dietary restrictions or if you don’t like some foods. The meals can be ordered individually, with many costing between $7 and $8. This is lower than many other companies – although there are some more expensive gourmet meals if you prefer. You can also order through a plan. The pricing is the same but this means less work than choosing meals individually. Top Chef Meals even has a four-week paleo plan that is entirely dairy-free. This can be a good place to start. Factor 75 isn’t completely dairy-free. Instead, the company’s philosophy focuses on high-quality ingredients and the idea that good food promotes health. As such, their meals are all free from soy and gluten. They also rely on grass-fed and pasture-raised protein sources, while ensuring the ingredients are organic and GMO-free. They do also provide some meals that fall into ketogenic, paleo, and dairy-free diet approaches. Icons are used to designate these different meals, making selection easy. Only some of the meals from Factor 75 are dairy-free. But, their focus on quality still makes them worth considering. With this company, you sign up to a weekly meal plan and then manually choose the meals for each week. There are five plans in total, ranging from 4 to 18 meals per week. The smallest plan costs $60, which averages to $15 per meal. The largest one costs $198, which averages to $11 per meal. The prices are on the high end but they’re still reasonable for an organic, sustainable, and gluten-free company. As for the meals themselves, there is somewhere around 15 to 20 available each week and the selection rotates. There is detailed information provided for each meal, including nutritional information, an ingredients list, and multiple images. The one catch is that only some of the meals are dairy-free. This limits your selection. For example, in this current week, I counted nine dairy-free meals. That’s still a decent range but it’s not as good as companies that focus entirely on dairy-free meals. This is another interesting option and it is a little bit different. Basically, California Chef Services provides a personalized service, one that tailors meals to the specific needs of their customers. In fact, the meals are specifically cooked for individual clients, which means the company can be much more specialized than most others. The style works really well if you have multiple dietary preferences. For example, you might meals that are both dairy-free and diabetic. Or, you could want dairy-free and low carb dishes. Most services won’t specifically address such combinations. They might have some suitable meals but probably not many. California Chef Services creates meals specifically for customers, making for a very personalized service. The dishes aren’t boring either. For example, reviews suggest that you’ll often see meals like Maple Walnut Ricotta Bake. There aren’t many photos of meals on the site but the ones that are present look amazing too. For people who want more control and for those that have multiple dietary needs, the company is perfect. But, there’s a catch – the pricing. Meals start at $25 for non-organic and $28 for organic. The cost per meal decreases a little if you want multiple meals each day. But, even if you’re getting four meals per day, the average is still $14 for non-organic meals and $17 for organic. The price may make the company unrealistic for many people. It is also a local company and just delivers to the greater Los Angeles area. As such, it won’t be an option for every situation. Ice Age Meals is another paleo company (well, it’s mostly paleo anyway), so it’s another good dairy-free option. In this case, the company offers 17 different frozen meals that you can select from and they’re all completely dairy free. Most of the meals are meat-heavy and they’re great ones to throw in the freezer for a rainy day. Because there are only 17 meals total, Ice Age Meals probably wouldn’t help if you wanted prepared dinners for every night of the week. The company also doesn’t ship out that way. Instead, you order a box of meals. This can contain 14, 24 or 48 meals – for $174.99, $279.99 or $534.99. You can choose the meals yourself or go with one of the company’s themed meal packs. Either way, the price is the same. This averages out to between $12.50 and $11.15 per meal, depending on the box you choose. Ice Age Meals offers 17 frozen paleo dinners to choose from, which are all dairy-free as well. The meals last at least three months when frozen. In a deep freezer, they can last anywhere from six to twelve months. As such, the style is perfect for stocking up your freezer. That way you always have good food on hand, regardless of what life throws at you. The meals from Sakara meet many nutritional criteria, including being gluten-free, dairy-free, plant-based, and organic. They are also non-GMO and the company avoids refined sugar. In fact, the meals have hardly any processing and often contain some raw ingredients, particularly greens. This is because Sakara maintains a strong focus on the ideas of detoxing and clean eating. This is evident in all of their meals. They also include various detox beverages as part of their meal plans, a pattern that most other companies don’t do. The meals are different as well. The focus on clean eating and greens mean that the dishes often look like something you would find on Instagram. Many of them can even be eaten chilled, while others may just need a little heating. Sakara focuses on plant-based foods with a large number of greens. The style isn’t for everyone. Many people would find the meals too heavy in greens or simply not satisfying. But, they are a powerful way to get extra nutrients, which is good for health and for weight loss. As for plans, Sakara allows you to order breakfast, lunch and/or dinner for three or five days each week. There isn’t much pricing information but the three-day option seems to cost $239, while the five-day costs $420, for three meals per day in each case. It’s also worth mentioning that options vary depending on where you live. So, some people can choose which meals they receive, while others are only able to get three meals each day. Regardless of your location, the meals you get come from Sakara’s menu. This changes weekly but you have no control over the meals in question. If you end up liking them all, that’s great. At the very least, it’s worth checking over their sample menu before committing to anything. Veestro is a plant-based company that relies on non-GMO organic ingredients. The meals are both vegetarian and vegan, which means that they’re also dairy-free. Of course, this means there is no meat present but you are getting many plant-based nutrients. Veestro operates a little differently than many of the other companies here. Instead of meal plans, they offer themed packs. These include options like Meatless Monday, Lunchbox Pack, Protein Pack, 21 Day Kickstart, and Starter Pack. The Starter Pack offers you 12 meals and one juice, while the rest contain 20 or more meals. Veestro has various themed packs to choose from, although these are all dairy-free. The packs all start out at either $8 or $9 a meal, although this can vary based on your selection. You pay for the entire pack at once and most are delivered in a single order, with all meals frozen. The style is amazing for increasing your supply and giving you plenty of options. No more hoping that you’re going to get interesting food on a given night – you’ll always have some options waiting in the freezer. Beyond this, you can also order meals individually. There are also Weight Loss and Juice Cleanse plans. The Weight Loss is more like a typical program and allows you to choose from three, five, and seven days each week, giving you three meals in each case. But, even here, you’re getting meals for two weeks at a time and get billed in the same manner. The overall style works well for some situations and perhaps not for others. You’re getting frozen dinners and many at once. But, customization is extremely limited and you don’t get to choose which dishes you receive. The main allergy option is gluten-free. Beyond this, you just have to choose packs that suit your needs. Unlike most of the other options on this list, Beetnik doesn’t actually state whether their meals are dairy-free or not. But, many of their menu items are Certified Paleo. Most definitions of the paleo diet mean avoiding dairy – and this particular certification follows that idea as well. Because of this, all of the paleo meals from Beetnik will be dairy-free. Some of the others may be as well. The company itself is interesting. They are A la Carte only, so there are no meal plans to choose from. Beetnik simply offers a range of frozen meals (there are currently 18 of them), along with two pasta sauces, and some grass-fed beef meatballs. The meals all cost $7.99 and they use either chicken or beef as a source of protein. They’re also all USDA Organic and gluten-free. Beetnik provides 18 frozen meals that you can choose from. They're all inexpensive and are dairy-free. You can order the meals individually from their site, paying attention to which ones have the paleo logo. Alternatively, you can order their Paleo Variety Pack, which costs $84.98 and provides 11 meals. The company works well for convenience and you can simply store the meals in your freezer until you need them. It is also one of the cheapest organic options out there. However, the dishes do still resemble conventional frozen dinners and they are light in vegetables. This may make them a poor choice for some situations. Because MamaSezz is a vegan company, all of their meals are dairy-free. They’re also gluten-free and contain no refined sugar, oils, or preservatives. There is an emphasis on locally-sourced organic ingredients, resulting in meals that are very good for you. As a vegan company, MamaSezz also heavily relies on vegetables in their meals. So far, MamaSezz sounds like multiple other companies in this list. That’s true too. But, there are some quirks that make this one a little different. MamaSezz offers large servings of food and meets multiple dietary requirements, including dairy-free meals. The first thing is the meals. Individual dinners from the company cost $15.99. But, they’re not single serving. Instead, they offer three servings. They’re also designed to be paired with a side or a salad to create a full dinner. This style is perfect if you’re providing for a family – or if you want leftovers. A second aspect is how you order. MamaSezz doesn’t have meal plans. Instead, you can either buy meals individually or through bundles. The bundles are themed collections of meals and most cost $89 or $99. You can order them as a single-time order or get them on subscription. Either way, they are a cheaper and a hassle-free way to get meals to your door. Examples of the bundles include: Family Bundle, Get Me Started Bundle, Healthy Senior Bundle, and Just for Me Bundle. This gives you plenty of flexibility to find the best choice for your needs. The one complexity is shipping. The cost varies depending on where you are. In some cases, you’ll get free shipping for orders of more than $89. Other locations get discounted shipping. The full details are on the MamaSezz site. But, the general idea is that the further you are from the company’s facility in Keene, NH, the more you will pay. If you’re local, you can skip the shipping altogether and pick up your order. The simplest way to describe Thistle is as a plant-based superfood company. There is an option to include meat in their meals but the emphasis is strongly on plants. Their meals actually contain an average of 5.8 unique fruits and vegetables and there are more than 40 superfoods used regularly in their meals. Additionally, all of the meals from Thistle are nutrient-dense, gluten-free, dairy-free, and organic. Thistle delivers fresh meals that always look stunning on the plate. This includes options like their Japanese Seaweed & Veg Bowl, Butternut Squash & Sage Pasta, and Curried Yam Stew. Needless to say, the meals are interesting and they’re much more appealing than frozen dinners you might get from the local grocery store. Thistle focuses on a large range of fruits, vegetables and superfoods – while offering some amazing meals as well. Thistle allows you to build your own meal plan. This includes picking how many days per week you want food (three, four, five, or six days), as well as whether you want breakfast, lunch, dinner, and/or juices. You’re free to change this plan at any time or to cancel whenever you want to. As always, the price depends on what you order. For example, the smallest option is a single meal for three days per week. Regardless of the meal, this costs $41.97 per week, with an average of $13.99 per meal. On the other extreme, ordering all four options for six days costs $276.00 per week. That’s an average of $11.50 per meal. Delivery is free in all cases. The price per meal is high on the small plans but it’s still reasonable for the quality of food that you get. The plans also end up being good value for money if you’re getting multiple meals per week. Plus, the dishes are much more interesting than conventional dairy-free meals – and are bound to keep you excited about your food. Healthy Chef Creations isn’t focused on dairy-free meals at all but they’re still an interesting choice. The main advantage is that this organic meals company is able to accommodate most dietary restrictions, including dairy-free, gluten-free, soy-free, and vegan. They do this by adding on a customization fee to their orders. So, you can pick whichever meal plan you like and then let them know your food allergies and preferences. This level of customization is unusual. Many other companies only cater for a narrow range of allergens and dietary needs, or they simply exclude a large number of them from all meals. 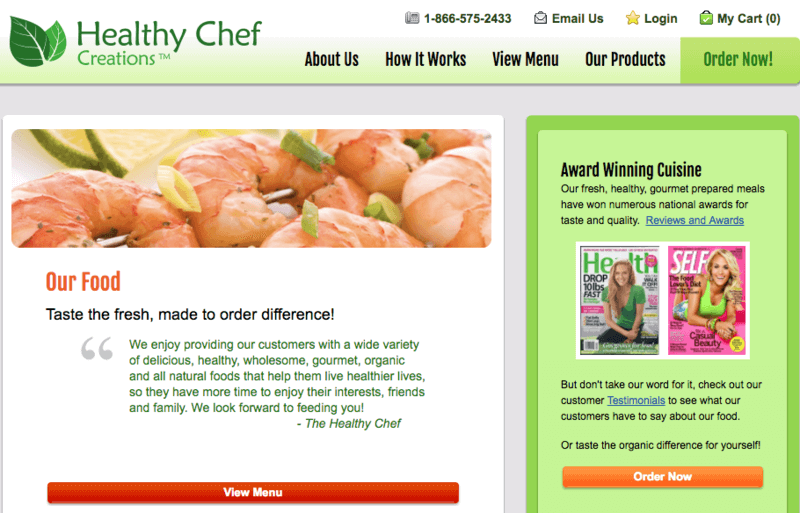 Healthy Chef Creations allows you to make many types of customization, including making meals dairy-free. Like other examples, Healthy Chef Creations offers two ways to purchase. The first is A la Carte. Here you simply buy the meals individually. The company doesn’t use dairy-free labeling here but any meals that contain milk have it listed under allergens. The other options is through meal programs. This involves selecting one of six different plans. These provide one, two, or three meals per day, depending on the plan in question. You can specify dairy-free under your food preferences for any of these. There are differences between the plans but they do allow you to choose how many days you want meals for. You can also choose the duration of the plan and whether it auto-renews. Some plans allow for other changes too, such as in the size of the meal. One other aspect to mention is the price. There are multiple plans, each with various options, which results in many different prices. This can be confusing and makes it tough to figure out the best option for your budget. Many of the plans average somewhere between $17 and $20 per meal. This makes it one of the most expensive meal options out there. And honestly, the meals seem fairly typical, so they may not be worth the amount charged. FoodFlo is a vegan company, so all of their meals are dairy-free. They also have some other interesting features – as the meals are gluten-free, organic, and alkaline. Many are also considered raw. These features should mean that you get fresher food than many other companies. The meals should also give you access to more nutrients. For example, one of their options is Mung Bean, Yam & Kale Stew, with Quinoa Pilaf. Another is Vegetable Cakes with Thai Curry Sauce and Broccolini Almondine. These are very different than what you would find at a conventional grocery store. FoodFlo provides a menu that changes each week, so you’ll get new options as time goes on. FoodFlo follows the concepts of alkaline foods, with many meals being raw as well. All of this sounds great and it is. But, the ordering approach is somewhat limited. Your main option is to order a Total Care Package. This arrives each week in a cooler bag. You pay $15 for each bag but you can swap them with the company weekly if you have a subscription. Each of these packs contains one soup, two side salads, four side dishes, four entrees and four snack bars. Many of these items offer multiple servings and you basically get enough food for five days (which is also around how long it will last). You can order this one week at a time for $139 or monthly for $499. There also some small add-ons but not many. The service is perfect if the Total Care Package gives you the amount of food you want. The style is much more interesting than simply getting chilled dinners and nothing else. But, there is little flexibility. The only way to change the amount you get is to add more on, which won’t always be suitable. This option will only help some people, as Kitchen Verde is located in Rochester, New York and mostly just serves the Munroe County area. But, if you are local, this is a very interesting company to look at. They offer vegan meals, which means that they are all dairy-free by default. Most of the dishes are gluten-free as well and Kitchen Verde chefs avoid oil when cooking, relying on healthier techniques instead. All meals are delivered fresh and can survive in the fridge for between three and five days. Kitchen Verde produces healthy, restaurant-quality food, although their delivery area is fairly small. The company provides a weekly menu that contains various items. The exact range and number changes from week-to-week but it includes breakfast, lunch/dinner, snack boxes, cold press juice, and desserts, along with a few add-ons. To order, you choose which items you want from the menu and simply add them to your cart. There is no minimum order size. Shipping costs $5 regardless of the order, or you can pick up for free. As you might expect, prices vary. But, dinners are around $9 or $10, while breakfasts are $7. This is inexpensive for fresh meals and most companies charge more. The style does mean you can’t predict what will be available each week. You also need to manually choose your meals, which can take time. But honestly, it’s less frustrating than having a company choose for you. At least this way, there is a better chance that you’ll actually enjoy the meals. If you have multiple dietary needs or very specific requirements, the NutriFit is an interesting choice. The company provides more customization than most other services out there. This includes the ability to exclude various ingredients, including options like dairy, fish, meat, nuts, and seeds. You can also specify a specific diet, such as lactose-free or anti-inflammatory. This style is really powerful if you have multiple needs. Most other companies may let you choose a few allergens and that’s it. They may also have few meals that fit your specific needs. NutriFit pulls from an extensive selection of recipes, so you should always be getting variety. NutriFit is an annoyingly complex company but it does offer many chances to customize. The company offers two general plans to choose from. Either will work for dairy-free. The first is Essentials. This lets you customize for up to eight allergens or dislikes, although there are some restrictions. The Premium plan allows you to change as much as you want to. It also gives you the chance to change any meals if you don’t like what NutriFit has planned for you. From this perspective, the company works well. It’s great if you want choice and if you have specific needs. But, there are two main limitations. First, NutriFit tends to be vague. They offer little information about the actual meals you’re going to get and even sample menus are tough to find. The other aspect is pricing. NutriFit offers a standard pricing chart for comparison but the amount you pay could be different depending on your choices. You also get lower prices if you pay for 28 days, versus one day at a time. If you go with the 28 days, then a Dinner Only plan costs $17.95 through Essentials and $28.95 through Premium. That’s pretty expensive, even for the Essentials version. One key aspect of Paleta is their focus on ingredients. With most companies, this would mean an emphasis on organic food and sustainable meat. Paleta still has that focus but they do so slightly differently. For Paleta, the priority isn’t organic certification. Instead, they look at the actual practices of the farms, choosing those that produce healthy ingredients. Many will be organic but others won’t be – as organic certification is expensive and some businesses simply cannot afford it. Paleta isn’t entirely dairy-free and you’ll still see dairy in many of their meals. But, they do have some useful programs that exclude dairy. One is their Paleo/Gluten-Free plan. Despite the name, this is isn’t entirely paleo but it still doesn’t contain any dairy. There is also a vegan meal plan. To use Paleta, you'd have to focus on their dairy-free plans. You also get the ability to choose your portions. Paleta provides three options here: Fit (1,200 calories), Lifestyle (1,600 calories), and Performance (2,200 calories). These are priced at $49, $59, and $69 per day, respectively. The prices cover all of your meals each day but there are options for changing how many meals you get (with a $25 daily minimum). Beyond this, Paleta also has a Personal Chef menu. This starts at $149 per day with a minimum order of ten days. The high price isn’t too surprising, as you are basically getting a personal chef. This means that meals are prepared specifically for you, based on your preferences. This is best for people with specific requirements or multiple needs. The food from Paleta looks amazing, better than many other companies. But, there aren’t too many specifics on the site. Details about individual meal prices are scarce and are likely to change based on the plan. It’s also not clear how much control you have over your meals each week. The average price also seems to be higher than most other companies. Because they’re a vegan company, all of the meals from Veggie Vibes are entirely dairy-free. Their dishes are also raw, gluten-free, soy-free, and organic. They avoid artificial ingredients as well, along with highly processed sugars and flours. Instead, they rely on options like olive oil, coconut oil, dates, and agave sugar. The end result is meals that are very unusual and certainly interesting. They can all be eaten cold, although you can also warm or cook them if you would rather do that. The only way to order with Veggie Vibes is through their menus and there are four of these to choose from. Veggie Vibes offers high-quality organic food and there are multiple plans to choose from. The first three menus are Alive, Reset Cleanse, and Savory Raw. Each has a different selection of food – and you don’t get to choose your individual meals. What you receive is based on the menu each week. The Alive and Reset Cleanse plans both offer breakfast, lunch and dinner, starting at $163 and $138 respectively for a three-day plan on subscription. The Savory Raw plan just offers lunch and dinner. It starts at $138 for the same duration. You can also choose to order for five or for seven days with each of these plans. But, those are the only options. The other plan is Your Selection, which is interesting. This one starts at $163 and has the same options for duration. In this case, you get a set number of items and you can choose what they are. For example, you might pick all breakfast foods or focus on dinner instead. You get to choose the actual meals as well. The menus change each week, so you have to make selection weekly. But, if you like the ability to decide for yourself, it’s a powerful menu. Sunfare is a good company if you want plenty of options. They offer five main meal plans, along with various ways to customize. For each plan, Sunfare uses a rotating menu where your meals are simply chosen for you. However, you have full access to that menu and can choose to swap out meals for alternatives as often as you like. The main option for dairy-free is the Paleo Fit meal plan that Sunfare offers. This follows paleo principles, which means all sourced of dairy are excluded. Some other ingredients that are avoided include grains, legumes, potatoes, processed oils, and refined sugars. Many of Sunfare's plans won't be relevant but they do have a Paleo Fit meal plan, which is dairy-free. The end result is a strong focus on whole foods. Sunfare offers images of the meals from their plan and most do look appealing, although they are on the conventional side. The ability to swap out meals means you can focus on the ones that you like the most. There are two general ways to purchase this plan. The first is through weekly ordering. With this style, you pay $24.95 for your first meal of any day. If you get two meals, the total is $37.90 and three meals comes to $46.85. If you want two snacks as well, you’re paying $58.75 per day. The neat part is that you can pick what you get each day. You might choose just breakfast on some days and just dinner on others. This level of flexibility is very unusual and appealing, even though $24.95 is very expensive for a single meal. The other option is a monthly plan. With these you pay $49.95 per day, which gives you breakfast, lunch, dinner, and two snacks. But, you must pay for either 20 days or 28 days up front. That totals to either $999.00 or $1,398.60. There is also a Paleo Fit Plus plan that is $54.95 per day and offers larger serving sizes. Sunfare ends up being a good deal if you’re ordering most or all of your meals every day. But, for people ordering relatively few, it is a pretty expensive service. As a vegan company, The Vegan Garden works well for dairy-free meals. This one is also a little different. Most other vegan companies strongly emphasize quality, relying on organic ingredients and sustainable practices. The Vegan Garden doesn’t do that. In fact, they don’t provide many details about their ingredients at all. That style isn’t all bad. Organic, local, and sustainably sourced ingredients might be the ideal but no one really knows how much difference these make to health. Instead, most of your health benefits come from relying on whole food regularly. The Vegan Garden allows you to do this. Because they don’t focus on sourcing as much, the price per meal tends to be lower. The Vegan Garden is surprisingly inexpensive per meal, especially for a vegan company. For example, one of their packages contains 14 dinners and 14 desserts for $160. If we ignore the desserts, that averages out to around $11.50 per meal. Another costs $520 per month and provides 28 meals per week. That averages to less than $17 each day and you’re getting three meals plus dessert per day. The price does vary between packs and The Vegan Garden does have many plans and packs to choose from. But, on average, the meals are less expensive than other vegan companies. That’s especially true if you choose the larger plans. The main limitation is that most of the packs allow for no choice. You cannot change how many meals per day or how many total days. Only two allow you to choose the meals. For the rest, you don’t even know what you’ll be getting and there’s only a sample menu to guide you. TrueFare is a paleo and Whole30 company, so none of the meals contain any dairy. This is another one that focuses on quality as well, including sustainably sourced protein and organic produce. There are certainly good aspects about the company. The food tends to look good (albeit a little boring) and there are multiple types of menus to choose from. Most of the plans are also reasonable, often calculating out to somewhere between $12 and $15 per meal. Meals can also be purchased individually, with most costing between $13.95 and $15.95. TrueFare has no shortage of meal plans, although it can take a little time to figure out the best choice. All of these aspects are great but there are limitations too. One problem is the plans. There are many different options and they each have their own specifications. For example, there is an AIP 5 Day Whole30 Program Meal Plan that starts at $175. That one offers three meals each day for the price. There is also a 5 Meals Subscription from $72 and a 40 Meals Subscription from $510. The different plans give you plenty of selection but you have to go into each one individually to see the requirements. It would take time to find the right one for you. Most don’t offer much customization either. You can make some minor changes but you can’t normally choose which meals you’re going to get and there are few options concerning frequency. The meals you get are chosen for you based on a weekly menu. The style does mean you’ll get variety and the meals may change with the seasons. But, the lack of control can sometimes be frustrating. Whether TrueFare works for you will depend on your needs. Personally, it feels like too much hassle for food that is middle of the market in terms of price and isn’t that unusual. As you’ve already seen, there are plenty of other companies to choose from. Caveman Chefs is a paleo company and like most of them, the meals are entirely dairy free. The company also avoids soy and gluten – and is able to cater to most allergies and dietary limitations. The meals they produce look excellent as well. The dishes are more interesting than the meat and veg that you might cook for yourself. The company offers two main styles of ordering, each with multiple options. The first is regular meals and includes a Medium Plan, Large Plan, and XL Plan. The Medium Plan has 550 calorie meals for $13.75 each. The Large Plan has 650 Calorie Meals for $16.25 each. The XL Plan has 750 calorie meals for $18.75 each. Those prices exclude taxes and any fees. You can order six or ten meals a week for four weeks, there are no other options. Caveman Chefs offers many different sizes for your meals and the company is entirely dairy-free. There is also a Dinner by the Pound menu. The options here are ½ Pound, ¾ Pound, and 1 Pound. The totals here refer to the amount of protein and you get double that amount in vegetables per order. You can get either three or five meals per week. These average out from $30 to around $56 per meal. Regardless of the plan, you need to pay monthly and you don’t get to choose which meals you receive. You can, however, select any dietary needs or food preferences and Caveman Chefs tries to accommodate these. The style means that you have limited options about how many meals per week and no choice about the meals. They’re also just dinners, so there are no breakfasts or snacks. But, the wide range of sizes is a nice touch. This would be great for people who are very active and those who simply have a big appetite. One Paleo Delivers is another paleo option and the meals are free from gluten, grains, dairy, beans, and refined sugar. The company focuses on using high-quality ingredients, subject to market availability. In practice, this means that most or all of a given meal could be non-organic. Despite this, the meals are extremely appealing and follow some interesting styles. And honestly – food doesn’t need to be organic to be healthy. Unlike most other options, One Paleo Delivers is local. It just delivers to the Southern California area – although it does make deliveries six days each week. As such, all of your meals arrive very fresh and you’re not getting a week’s worth at a time. One Paleo Delivers focus on quality meals and provides many options to choose from. There are two main menu options with this company. The first gives you two meals and one snack daily (from $40 per day). The other gives you three meals and two snacks (from $55 per day). The prices are reasonable, if you want this much food. The company isn’t viable if you just want one meal per day. There is decent flexibility with the plans. For example, you can choose a duration of 5, 10, 15, 20, 30, or 60 days, with the price per day decreasing for longer durations. You can also choose your portion size, ranging from 700-900 calories per day to 1,600-1,800 calories per day. Add-ons are available too, allowing you to increase the number of meals or snacks you get. The main limitation is plan size. Even the smallest option gives you two meals and one snack per day. That might be more food than you need and you can’t change this aspect. For that matter, you may just want meals, not snacks. Don’t get me wrong, this one is still a great time-saver and the food looks fantastic. It’s just one of those companies that might fit your needs. Or, it might not. Schwan’s has a large range of frozen meals, covering lunches, dinners, desserts, snacks, and pretty much everything else. Many of the products are available in local grocery stores but the company also offers a delivery service. This is perfect if you already like their meals and don’t have the time or energy to shop for them. Schwan’s doesn’t offer meal plans or specific packages that you order. Instead, you choose meals individually. They’re already frozen, so this is an easy solution for stocking up your freezer. The main way to order is through the website for Schwan’s, although they do have an app and even some distributors. Schwann's offers many different frozen meals, including dairy-free options. Because Schwan’s is such a significant company, they offer a considerable selection of meals. This includes many different styles as well. They don’t specialize in dairy-free meals but some options are dairy-free. They also have a LiveSmart range that focuses on health. There are vegan meals within this range and those may be perfect for anyone avoiding dairy. The prices of meals vary depending on what you buy. Some are as low as $4, while others are as high as $25. But, the price is normally a reflection of the size and quality. Most of the meals do tend to be competitively priced. In fact, dinners from Schwan’s are likely to be cheaper than many other items on this list. Vegin’ Out operates out of Los Angeles, although they will ship throughout the United States. The meal service is vegan, which makes it a good choice for any dairy-free eaters as well. There are two main options for ordering. The first is a Single Meal Delivery. This order gives you three entrées, four side dishes, one soup, and five cookies. The Double Meal Delivery simply provides twice as much. You can order extra sides, entrees, cookies, or salad dressings but there is no way to order less. Vegin' Out provides one main package of vegan meals, although you can order some extras. It’s not entirely clear many days each delivery would feed you for. That partly depends on how much you eat and how you distribute the meals and side dishes. But, there isn’t much flexibility. You can request for some ingredients to be avoided – and Vegin’ Out will skip components that contain them. But, this just results in doubles of other sides or entrées. What you receive each week is also based on the weekly menu – and you don’t get to make food choices yourself. This is great if you don’t want to think about your meals at all. But, many people want more control. The pricing is somewhat complicated. How much you pay entirely depends on where you live. In Los Angeles, a Single order costs $129.99 per week, while a Double one costs $234.99. For Southern California, Northern California, and Arizona the same options cost $145.00 and $259.99. For anywhere else in the nation, the prices are $189.99 and $360.98.